Photovoltaic (PV) systems, which harvest sustainable and clean energy from the sun, accumulate dirt or particles like dust, water and sand. 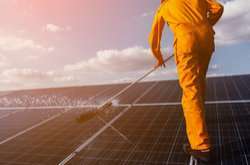 This build-up leads to a reduction in the light energy reaching the solar cells and lowers their power output by up to 50%, according to some studies. Therefore, it's crucial to keep them clean. However, the process of regular cleaning and maintenance could be costly and also waste water. Enter the EU-funded SolarSharc project, whose highly repellent coating technology will eliminate surface contamination, optimising energy efficiency and PV yield. In an interview published on the European Coatings website, David Hannan from project partner Opus Materials Technologies said developments in anti-soiling coatings are being driven by the sustainability agenda and the need for clean power. He highlighted the challenges involved in the production of solar energy and added that "dust, dirt and fouling of solar panels are major sources of inefficiency and loss in solar generation, resulting in lost generating capacity to a value in excess of EUR 40bn p.a. In turn this causes over 100Mtonnes of CO2 emission through fossil fuel generation in order to make up the shortfall." Hannan pointed to the drawbacks of existing self-cleaning coatings, such as "a short lifetime (2-3 years), poor transparency and high cost (over €260/litre). This means that they are not usually cost-effective and are not deployed, with losses accepted as the lesser economic impact for the operation of the plant." According to the project website, SolarSharc's nanoparticle structure provides "high transparency, improving generating efficiency by 4 % and improving aesthetic quality for architectural applications. Silica chemistry is non-hazardous and permits scaleable manufacture." In addition to being durable and self-cleaning, SolarSharc is "anti-reflective, resistant to high temperatures and offers outstanding weather resistance." Thanks to its anti-reflective properties, SolarSharc "leads to an improvement in transmittance to enable over 93 % of all available light to reach the PV semiconductor." The inorganic-organic hybrid coating of SolarSharc is only a few microns thick, as explained on the project website. "Based on a silica (glass) network chemically bound to non-stick organic groups Solar Sharc [coating] readily repels water and water-borne contamination. Rather than wetting the surface, water droplets form beads on the coating and readily roll-off at low angles." It also states that solid contamination, such as dust and sand, is "easily removed by the action of wind or by the use of minimum amounts of water." The markets targeted by the project are utility-scale solar and the rapidly growing building-integrated photovoltaics (BIPV). Project partners hope to commercialise the SolarSharc coating and new self-cleaning BIPV modules "from the current TRL6 [technology readiness level 6] prototype to operational demonstration (TRL9) in BIPV, certification, commercialisation and supply chain measures to deliver rapid growth," as stated on CORDIS.